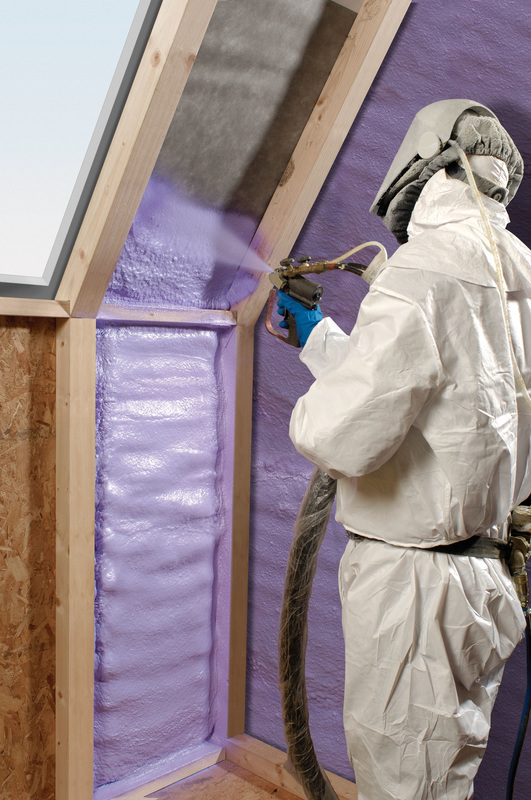 Spray Foam Orlando is the premiere contractor for the installation of spray foam insulation in the Orlando, FL market. We perform quality work at a competitive price, and will make sure the job is done right the first time. We realize that this is a hefty green investment for your family, so we will make sure we are very clear on the scope of work, as well as the price with no hidden fees. Spray foam, when properly installed on your roof deck, can significantly improve the energy efficiency of your home or business. By the proper application of spray foam insulation, the objective is to completely seal the roof deck so there is no air flow in or our of the attic area with the outside environment. This seal is what creates the sealed envelope, thus significantly improving the energy efficiency of the structure. When properly installed on the underside of the roof deck, the traditional insulation on the attic floor becomes irrelevant. After the spray foam insulation is properly installed in your attic, the attic becomes similar to an igloo and there is no air flow in or out of the attic area. This might not sound like a good thing, but it is actually ideal to achieve energy efficiency. The reason is quite simple. In the average Florida home, unsealed attics with traditional insulation become stifling hot in the summertime. Generally upwards of 140 deg F. So if the average interior home temperature is 78 deg F, this creates a significant difference in the interior and attic temperatures. This difference is what creates the excessive work for your AC system, as that hot air pounds away at the cooler, interior home. The primary objective in sealing the attic is to create a sealed, efficient envelope where the attic temperature is within 15 deg of your interior temperature. This balance creates an environment where the AC needs to operate much less often to maintain the desired interior temperature. The opposite is true as well, in that the greater the "delta" between the attic temperature and the interior living space, the less efficient your structure will be and the harder your AC will work to keep your home comfortable. This translates into much higher utility bills. So if you ever hear your AC turning on and off four or five times each hour in the summertime, this is exactly why. That hot attic air is forcing your AC to work in overdrive in order to maintain the desired interior temperature. If all of these factors are achieved at a sufficient level, then the application should be of sufficient quality to provide the highest energy efficiency possible. Our spray foam technicians are experienced and competent professionals that will ensure your project is installed with the highest quality and performance. 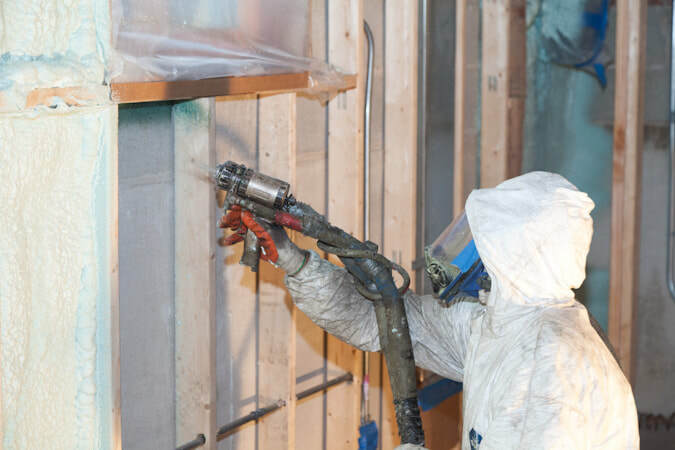 Spraying polyurethane spray foam requires experience, knowledge of the equipment, and hundreds of hours of practice. It is more art than science, and a proper job requires safe work practices, attention to detail, and a mastery of your craft. A sloppy job can turn your attic into a war zone, that will leave you frustrated and disappointed. It is imperative to fill every "nook and cranny" in the attic space or concrete block (CMU). This ensures the greatest energy efficiency and the tightest building envelope. 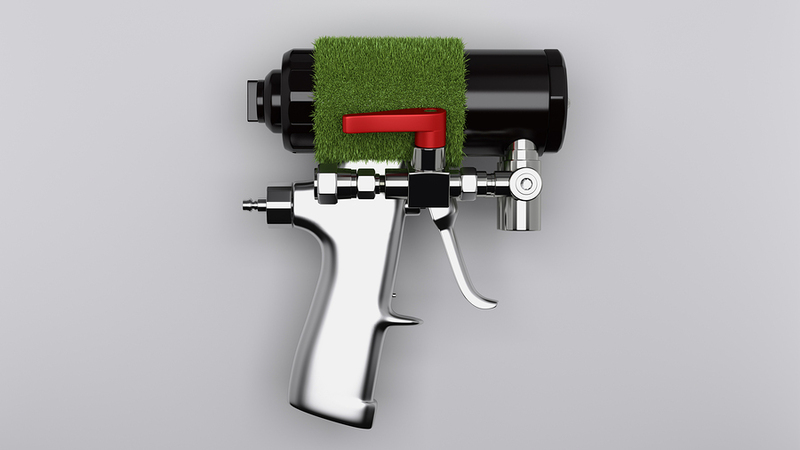 Our spray artists will make sure this is achieved. Florida Building Code requires R-19 for spray foam installed on the underside of your roof deck. This R-19 number is a very important number, as it affects many different things. For one thing, it is imperative that you hire a spray foam contractor that will install the required spray foam to achieve this code-required value of R-19. To achieve R-19, the contractor must spray 6" of open-cell spray polyurethane foam, or 3" of closed-cell foam. 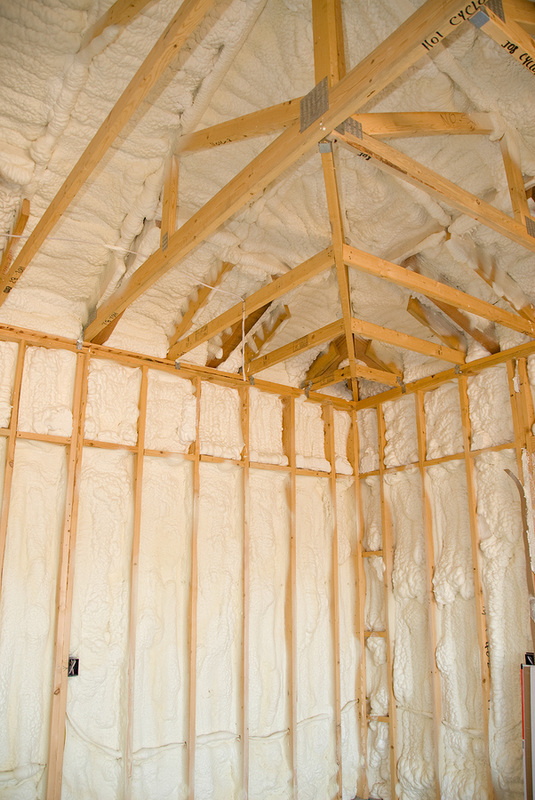 Many spray foam installers will be hired to install this thickness for the open or closed-cell foam, but only spray one-half of the required amount. This is because the material (spray foam) is a large percentage of the job cost, so this short cut saves them money. However, it has two very negative effects for the homeowner. First, your home or business will not be nearly as efficient as promised. Instead of your utility bill being reduced 25% to 40%, it might only be 15%. Not what you paid for so don't let this happen. Second, when it comes time to sell your home years down the road, the buyer is going to hire a home inspector who is going to check the thickness. If he or she determines that you have one-half of the required thickness, than you are not in compliance with Florida Building Code, and you have a very expensive problem to fix if you want to sell your home! Spray Foam Orlando will install the correct amount of spray foam insulation, and we will confirm with you, the homeowner, that we have. This will give you peace of mind that your project was done correctly. When installing spray foam insulation, it is vitally important to follow the strictest safety procedures to not only protect the crew, but to also make sure there is no damage to your home. At Spray Foam Orlando, our #1 priority is the safety of our crews and the protection of your home. This does not happen by chance, but rather as a result of a focused effort to instill safety in our team. Spray foam can be very dangerous, as the spray installers are operating in the attic and if not careful can step through the attic floor which is nothing more than drywall. This means that best case, you will have a hole in your living room ceiling, and worst case, you'll have a broken coffee table and a badly injured spray foam installer. At Spray Foam Orlando, we make sure each crew member is properly trained so this does not happen. He or she will have all of the proper equipment, and the attic will be sufficiently illuminated to reduce the risk of accident as much as possible. Regardless of taking every possible safety precaution available, humans have to install this spray foam, and accidents do happen even at the very safest companies. For this reason, it is imperative that you hire a fully-insured spray foam installer to perform your project. This includes complete commercial insurance, as well as complete Workers' Comp insurance. This will ensure that you, the homeowner or business owner, is fully protected. All you have to do is ask your Orlando spray foam installer to provide you with a Certificate of Insurance prior to starting any work on your project, and then send that to the agent or carrier who handles your home hazard insurance. Now you will be protected in the event of an accident. As you can likely imagine, the installation of spray foam insulation is a very messy job. If not properly maintained on a daily basis during the project, your home or business can become an extraordinary mess that is hard to recover from. At Spray Foam Orlando, we take great care and go to extensive lengths to keep an neat and orderly project site. We take housekeeping very seriously, and will always make sure that debris is not left around, and we do not impact or disrupt your home or business environment. Our spray foam technicians are well-trained in maintaining an impeccable project that you will certainly appreciate as the the job progresses. Call us today at 407-641-2746 for a free estimate for your home or business. Spray Foam Orlando will do a professional job so that you will realize all the savings that have been advertised, as well as the increased value of your home or building.